Proclamation of Hope premiered April 2011. 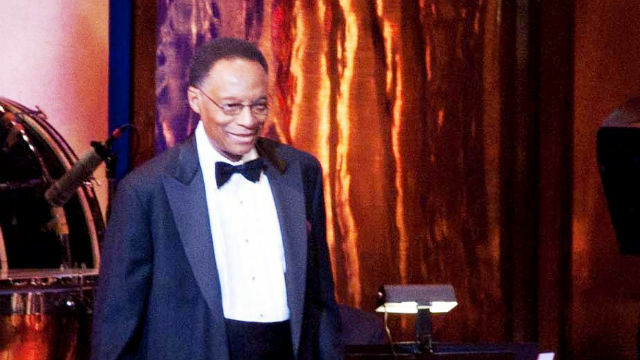 Proclamation of Hope is a multi-media symphonic concert by jazz legend Ramsey Lewis. Proclamation of Hope is a large scale, multi-media symphonic concert by jazz legend, pianist and composer Ramsey Lewis. Almost 150 years after his untimely death, Abraham Lincoln is considered by many to be America's greatest President, as much for his leadership during a time of crisis as for his eloquence and humanity. Among those artists who were inspired to pay tribute to Lincoln during his bicentennial year was Grammy-winning jazz legend, pianist and composer Ramsey Lewis. In the summer of 2009, Lewis premiered a new, large-scale, multi-media symphonic poem at the Ravinia Festival in Highland Park, Illinois, which had commissioned the work to commemorate Lincoln's 200th birthday. Now, public television audiences will have the opportunity to experience Lewis' vision, as his profoundly moving work Proclamation of Hope comes to PBS. The work is scored for wind ensemble, rhythm section and voice and is organized in eight discrete movements. Visual images from a range of sources depict various historical moments and concepts, and are viewed as the group performs the composition. Mr. Lewis' own journey positions him as the right artist to interpret this story, staggering in its complexity, yet so elemental in its humanity. As a musician who has crisscrossed the stylistic terrain of the American musical landscape with uncanny aplomb, he draws on the many lessons he's learned through his various experimentations with genre and musical communication. His training and involvements in European classical music, soul-jazz, swing, gospel, and more, all manifest here with stunning results, as he expands our imaginations, this time through sound, image and word. The symphonic poem is typically defined as a composition beginning with an extra-musical inspiration—a poem, novel, painting or even a broad concept such as nationalism. Proclamation of Hope uses this form to frame, in eight episodes, the social, cultural, political and historical space between Abraham Lincoln and Barack Obama. Reflections on the commonalities between these two historic figures have abounded: similarities of their strength of character, clarity of purpose and depth of intelligence. But Mr. Lewis meditates here on the more sublime and illusive concept of hope that each president stirs in him. With music as his primary mode of communication, he engages the mix and jumble of this narrative also through the media of image and the words on this page. It should come as no surprise that he has taken this model from his home turf: the art of jazz. With thoughts and narration presented by Mr. Lewis himself throughout the concert’s eight movements, Proclamation of Hope will serve a permanent place in American musical history to be proudly shared and enjoyed by many generations to come. Check local listings to see when it is airing on your local PBS station. Proclamation of Hope was produced in HD by WTTW Chicago at the Kennedy Center for the Performing Arts in Washington, D.C. Executive Producers for Proclamation of Hope are Ramsey Lewis and Nicolette Ferri. Producer is Nicolette Ferri. Director is Steve Purcell. Senior Executive Producer is Frances J. Harth. Arranged and conducted by Scott Hall. WTTW National Productions Executive-in-Charge is Parke Richeson. Own this DVD to see Ramsey Lewis' large-scale multimedia composition. © 2011 Window to the World Communications, Inc. and Ramsey Lewis Productions. All Rights Reserved. Text by Mike Egan. Photos courtesy of Bill Richert.